Colic. Gas. Tummy pain. Sounds familiar, right? If you are a new mother, you must be prepared to encounter those as possible reasons of your baby’s fussiness. To relieve your little one of those symptoms, your Pediatrician may recommend gripe water. ​So what exactly is gripe water? Gripe water is an alternative medicine with organic or natural herb ingredients to soothe baby’s stomach ailments often associated with flatulence, colic, or hiccups. To help you ease your baby’s discomfort, I would properly guide you to a better understanding of the benefits of gripe water and help you choose the best gripe water on the market today. So, let’s start the show! Is Gripe Water Safe for Babies? When does your Baby Need Gripe Water? My best pick, of course, is a bestseller, parent-approved, and recommended by pediatricians. Mommy’s Bliss Gripe Water has natural ingredients of fennel and ginger to facilitate digestion and gas relief. It is also a good choice for babies with acid reflux. It is also used to deal with your baby’s teething and the fussiness it brings. The liquid texture of Mommy’s Bliss is thin like water, so your baby can swallow it easily. Besides easing your baby’s tummy discomfort, it affects your baby’s overall well-being by helping your child achieve a stronger immune system. Mommy’s Bliss is all-natural- no artificial flavors or colors, no gluten, and no alcohol. Plus, the best part? Mommy’s Bliss is 100% vegan and vegetarian. And did I just forget to say that it is sugar-free! This product is best for stomach acid problems like hyperacidity because it contains Sodium Bicarbonate which works as an acid neutralizer and the Dill oil which deals with indigestion, thus providing your baby a healthy growth. Parents also love giving it to their baby’s in their teething periods. I love the simplicity of this product with fewer ingredients and mild flavor that your baby will love. The only downside for me is the little sugar in it, but the study says sugar actually helps with tummy problems. Only one teaspoon of this alcohol-free gripe water every day could prevent you from gastric attacks. And this works for adults too! This product is made in India and is certified halal. For frugal moms, this one is made for you. 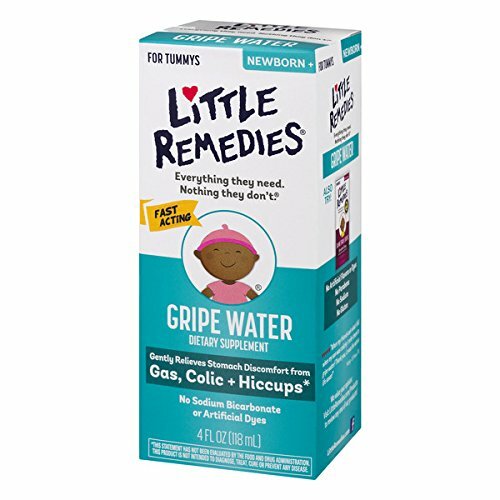 Little Remedies is one of the cheapest gripe waters in the market with the same effectiveness. It may not be organic, but all ingredients are natural and free of synthetic preservatives. Ginger and fennel are well-known herbs for centuries thus tested by time to aid good digestion. It is a safe and gentle formula to solve your baby’s fussiness due to stomach discomforts such as colic, gas, and hiccups. What I love about this supplement is the alcohol-free and sodium bicarbonate-free formula. Plus, it has no artificial flavors, gluten or parabens. There’s nothing artificial about this product, and with the included dosage dropper, the exact dose is delivered properly to your baby. Little Remedies knows exactly when to comfort your baby. This gripe water will treat your baby day and night. The two in a pack bottles are used to treat your baby’s symptoms of gas, colic, hiccups, and fussiness. This grape water contains ginger and fennel which shown to be beneficial as an aid to digestion. Plus, a soothing chamomile for the night time formula to provide your baby a good sleep. Little Remedies is safe and gentle with no alcohol, artificial colors, flavors, gluten, or additives. Less is more with this product with fewer ingredients but not sacrificing its’ effectiveness. Because you have to buy two bottles, the price will be a little bit higher, but worth it! For organic believers, this one is for you. Wellements Organic is USDA certified organic and natural product to keep your baby safe. It is highly likely to be recommended by your pediatrician. It is your safe, fast, and effective solution to all of your baby’s fussiness- colic, gas, flatulence, teething, hiccups, name it! All-natural means it is free of gluten, alcohol, dairy, soy, and all artificial ingredients. And because it is organic, meaning no chemical preservatives. Because of this, you need to store it in the fridge after opening or it will go bad. Nevertheless, it is just a minor inconvenience for a great product. Rounding up my list is gripe water from my best brand, Mommy’s Bliss. This time it promotes your baby a nighttime rest. Why night time? Researchers believe that colic in babies is either because of the immature nervous system, sensitivities to foods, or imbalance in the gut. Though there is no definitive cause, we may agree that colic often occurs in the late afternoon and evening. The possible cause might be it’s the peak time of baby’s crying. 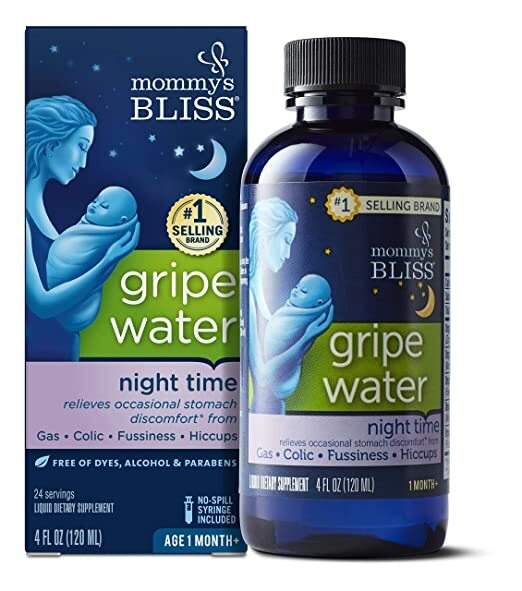 Mommy’s Bliss gripe water could help your baby feel and sleep better at night with its natural herbs of chamomile, lemon balm, and passion flower that promotes a restful sleep while relieving your baby of stomach discomforts by the original formula of fennel and ginger. Check this out if your baby seems fussy at night that deprives you and your baby a good Z. There is no scientific evidence to confirm whether gripe water is good or bad for the baby. However, it is safe depending on the ingredients. The original formula of gripe water contained alcohol which is definitely a no-no for your baby. Over time, manufacturers dropped alcohol as composition due to objection from parents and medical practitioners. 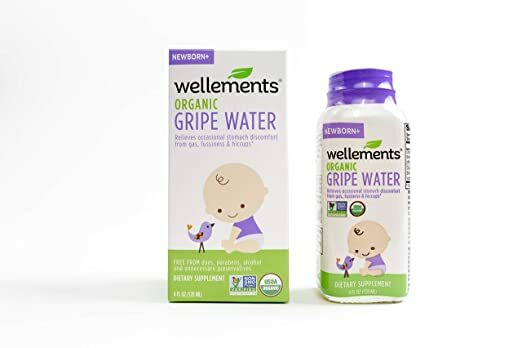 Nowadays, gripe water is made up of a natural mixture of herbs and water, but others still contain some of the original ingredients of dill oil, sodium bicarbonate, and sugar. However, the composition differs from the country where the product is manufactured. 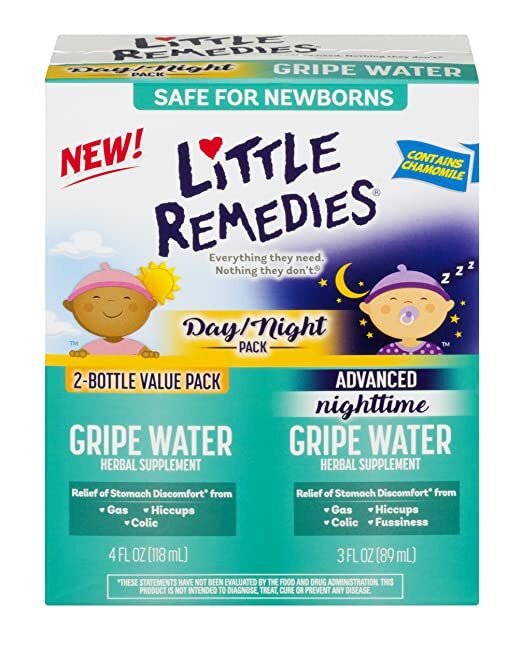 To ensure that you purchase the best gripe water, I make sure that my list above provides you the safest product as possible. Colic - This is what gripe water is used for, to calm baby’s tummy. Gas - It brings relief to babies feeling full from flatulence or gas. Hiccups - The irritations on the diaphragm stimulated by gas or acid reflux can cause hiccups. Gripe water can treat this problem. Acid Reflux – Some gripe water contains Sodium Bicarbonate which is known to neutralize acid in the stomach. Teething – Babies swallow a lot of air while crying from a painful teething that will lead to flatulence. Sleeplessness – Some gripe water has ingredients that promote a good sleep to your little one. 1. Baby Spit Up Curdled Milk: Is It Normal ? Natural or organic herbs : Depending on the brand, ingredients may vary but typically contains fennel, dell and ginger extract known to be natural remedies for indigestion. Sodium Bicarbonate : Known to treat acid in the stomach but could lead to alkalosis if taken in high amount. Sugar : Typically, most gripe water contains sweeteners like agave syrup or fructose. It is believed that sugar actually helps in relieving stomach discomforts. Just make sure that it contains a little amount as too much sugar is not good for babies. Luckily there are few sugar-free brands. Preservatives : Potassium Sorbate is present in some to preserve your gripe water. Without it, your gripe water could have a shorter life. However, preservatives are considered harmful to your baby. Alcohol : Research shows that alcohol is not a necessary ingredient and can be addictive to both babies and adults. Gluten : It can cause allergy to most babies. Most pediatricians may approve or may actually recommend a brand. Some babies may like or not like a certain flavor. Be aware of your baby’s food allergy, or if your baby had other conditions, gripe water might not be suitable for him. Always read the label. Sometimes, we would know the effectiveness of a certain product through testimonials from other parents who had used it. Baby’s age - Typically, most brands recommend giving it to your baby after two weeks old and over 7 pounds. Don’t give on an empty stomach - The stomach lining in babies are too delicate for any supplements. Don’t mix with milk or other liquids - It may alter the effectiveness of the product or may cause an adverse chemical reaction. Read the Instructions – Different brands may have different recommendations. Give the right dosage – Always give correct amount to avoid over dosage. Check Expiration Date – Do not administer beyond expiry. Tummy Massage - Tummy massage may help release abdominal gas and muscle tension. Burping - It helps release the air that your baby swallows especially after feeding. Swaddling - Swaddling has a soothing effect of providing warmth and comfort for your baby. Changing of Formula – You should consider your baby’s formula milk as the reason for his frequent tummy problem. Though gripe water may have a positive effect on your baby’s condition, don’t get disappointed if gripe water is not a miracle cure you want it to be. All babies are different as well as their tummy. You should trust the parents that swear to its efficacy and also, trust your instinct. After all, it is your preference and your baby’s need that is most important. It is best to consult your health care provider and read the label first before giving any supplement to your baby. My best pick - the Mommy’s Bliss Gripe Water guarantees a product that is not only safe but effective as well, to ensure that your baby will have a happy tummy!